Rediff.com » Business » Look at the building boom world over! Look at the building boom world over! Fast paced urbanisation has taken a toll on the environment. As the world's green cover gets replaced by a concrete jungle, climatic conditions across the world have changed for the worse. The natural desire to keep cool and entertained in the Gulf's hostile climate has helped make the United Arab Emirates one of the world's top five power consumers per capita while emissions of climate-warming carbon from Emiratis are more than twice those of US citizens. Dubai alone used nearly 34,000 gigawatt hours (GWh) of electricity, with 46 percent being used by the commercial sector and nearly 30 percent in housing. 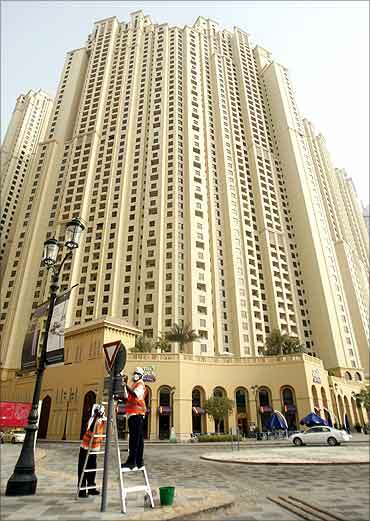 Image: People work on a street sign near residential towers in Jumeirah Beach Residence (JBR). 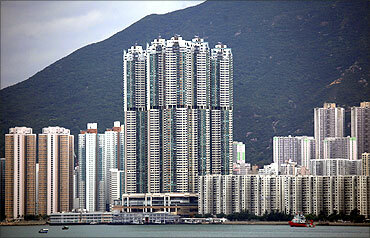 A private development each measuring 219 meters is seen on eastern Hong Kong island. About 25 percent of the world's tallest 100 residential buildings that stand at least 200 meters tall are in the territory. The world's population is projected to reach seven billion on October 31, according to projections by the United Nations, which says this global milestone presents both an opportunity and a challenge for the planet. While more people are living longer and healthier lives, says the U.N., gaps between rich and poor are widening and more people than ever are vulnerable to food insecurity and water shortages. Image: Five blocks of the 66-floor Grand Promenade. A resident sits outside on the terrace of 'New York' by Gehry, Frank Gehry's new 76-storey, luxury residential tower in New York. The tower is five minutes from the site of the World Trade Center's twin towers destroyed in the September 11, 2001 attacks. 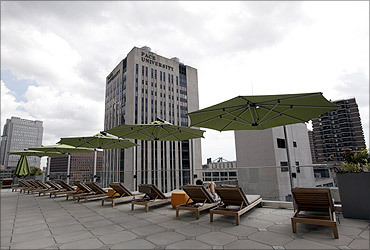 Forest City Enterprises spent $875 million for the building, which includes a public school on the first four floors, and received $190 million in low-cost Liberty Bonds. Half its 903 units have been rented since it opened in March. Image: luxury residential tower in New York. 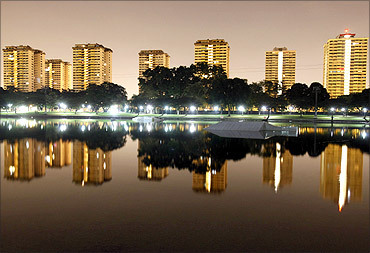 Housing Development Board (HDB) apartments are reflected on a lake before dawn in eastern Singapore. Among non-Singaporean property buyers that comprise of foreigners and Permanent Residents, mainland Chinese buyers from China made up 26 percent of purchases and were the top purchasers of residential properties for the second consecutive quarter. Image: Housing Development Board (HDB) apartments. 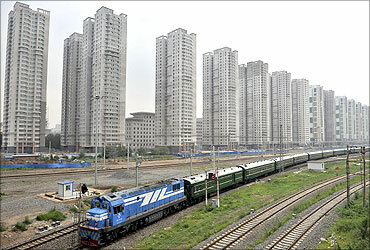 A train runs past newly-built residential buildings in Shenyang, Liaoning province. Image: Residential buildings in Shenyang. A man walks along a common corridor of an old public housing estate flat in the Katong residential area in Singapore. 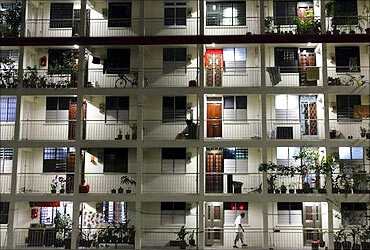 Image: An old public housing estate flat in Singapore. 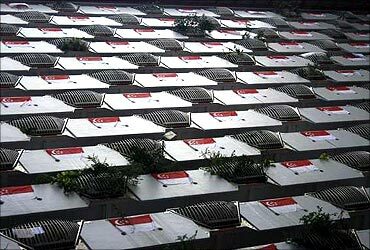 National flags are seen hanging from balconies at a public housing estate in Singapore. Image: A public housing estate in Singapore. 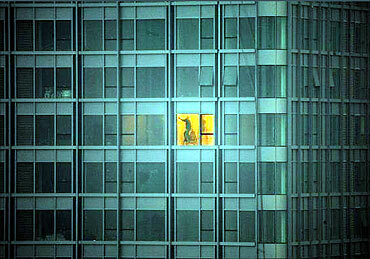 A construction worker makes final touches in a newly built skyscraper in Beijing. Image: A newly built skyscraper in Beijing. A view of a building at the beach of Torremolinos, near Malaga, Spain. Image: A building at the beach of Torremolinos. 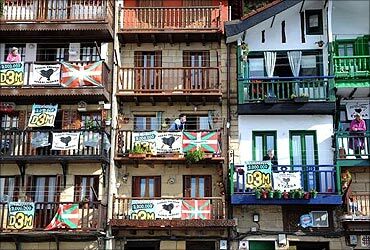 People listen to a pre-electoral meeting from balconies adorned with Basque flags and posters in Pasajes San Juan, Spain. 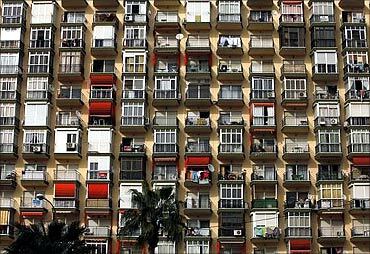 Image: A building in Spain. 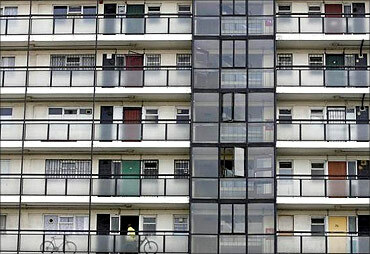 A man stands on his balcony in a block of flats in London. A view of a residential building in Shanghai. 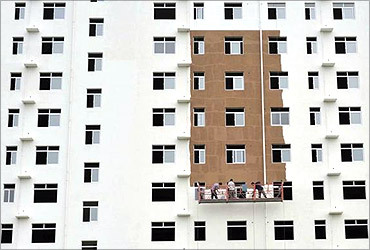 Workers paint the exterior of an unfinished residential building in Xiangfan, Hubei province. Image: Residential building in Xiangfan. 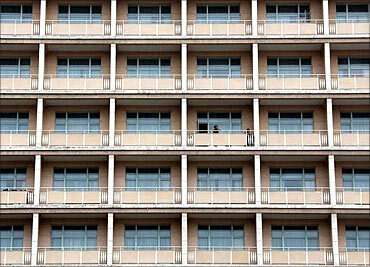 A woman looks out over the city as she stands on the balcony of a large hotel located in central Beijing. 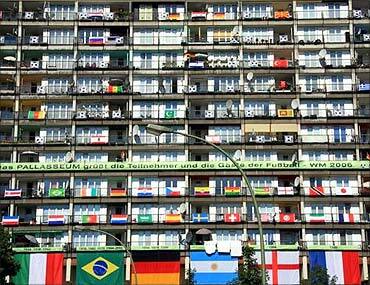 National flags, some of nations competing in the soccer World Cup 2006, adorn a residential apartment block in Berlin. Image: A residential apartment block in Berlin. 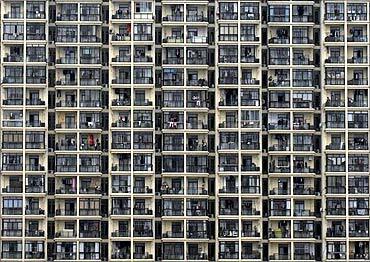 An apartment complex for labourers who work at a shoe factory is seen in the city of Wenzhou, in Zhejiang province. 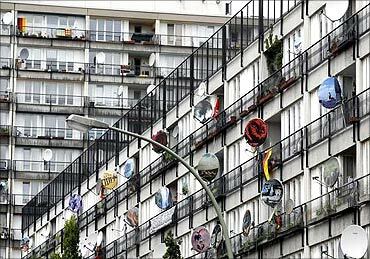 Painted satellite dishes designed by German artist Daniel Knipping are set up at an apartment building in Berlin's Schoeneberg district. Image: Painted satellite dishes at an apartment building. 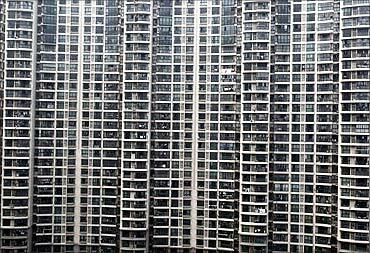 A view shows a residential building in Shanghai. 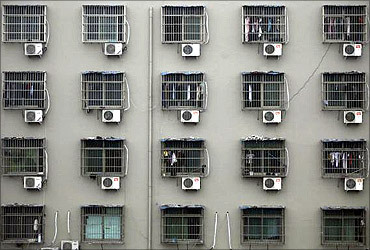 Image: A residential building in Shanghai. 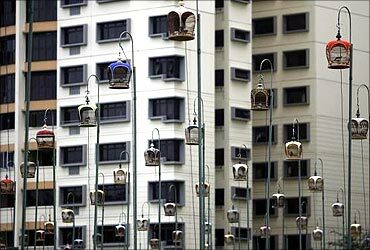 Doves sing in cages hung on the top of poles during a bird singing competition in Singapore. Image: Doves sing in cages. A woman looks out of a window of a building in Diar El Kehf, Algiers. 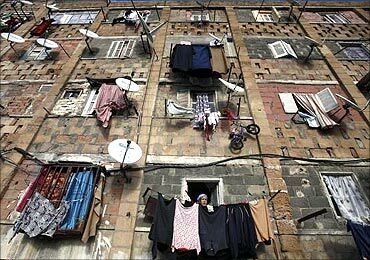 Image: A building in Diar El Kehf, Algiers.